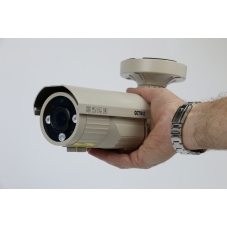 Good quality day night CCTV cameras for sale in either standard definition or HD1080P. Available with a full range of lens options from wide angle to long range. Buying the right cameras is important if you want to record high definition and identify people. If you need help choosing a camera we have a camera buying guide which covers all the key points. Alternatively feel free to contact us via the phone or email. We are a real company, not just a website and are happy to provide advice relating to your specific project. 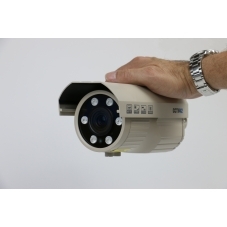 Our day night cameras can be mounted on any surface: vertical, horizontal, top or bottom fix. They also feature a 3rd axis of adjustment which allows you to level the horizon once the camera has been fitted. This feature compensates for surfaces which aren't perfectly plumb and allows 180 degrees of flexibility in any direction, (see the mounting range as half a sphere behind the camera). The large mounting surface means fixing screws are easily accessible enabling the use of power tools. Because the main body rotates on the mount you can also swivel it round to allow easy access to all 4 screws. There aren't any hard to reach screws hiding under the camera's body. The cameras all feature a video take off point and come with a BNC fly lead which plugs into it. This means that when the cameras are installed with hidden wiring (the cables exiting through the wall) it is still possible to use a CCTV set up monitor with ease. The large mounting foot also means there is no danger of mounting screws failing because they are too close to the cable hole in the wall. 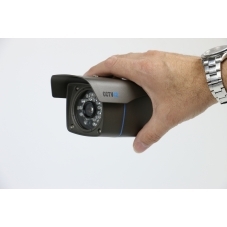 All the cameras feature adjustable Infra red, I/R illumination allowing it to be turned up or down to suit different applications. 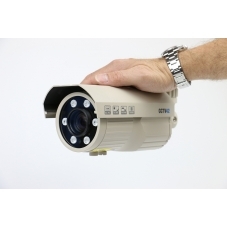 All the cameras in this range are suitable for both indoor and outdoor use and are IP rated to IP66. The sunshade can be adjusted or totally removed if required. Styling-wise the cameras have a modern almost scientific look making them suitable for almost any environment, they also act as a high visual deterrent. This camera body style allows us to incorperate the full range of lenses from ultra wide angle 2.8mm right up to our incredibly powerful 50 and 60mm telephoto lenses for incredible detail at distance.